Please join us Wednesday February 21st, 6:30-8:00pm at the Kenton Firehouse, 2209 N. Schofield for the quarterly Friends of the Columbia Children's Arboretum meeting. 6:30pm SDC funds project proposed timeline and schedule. This project's main goal is to make the path through the Arboretum ADA accessible. Other projects can be suggested. In less than a month, the 2018 Legislative Session will be in full swing. 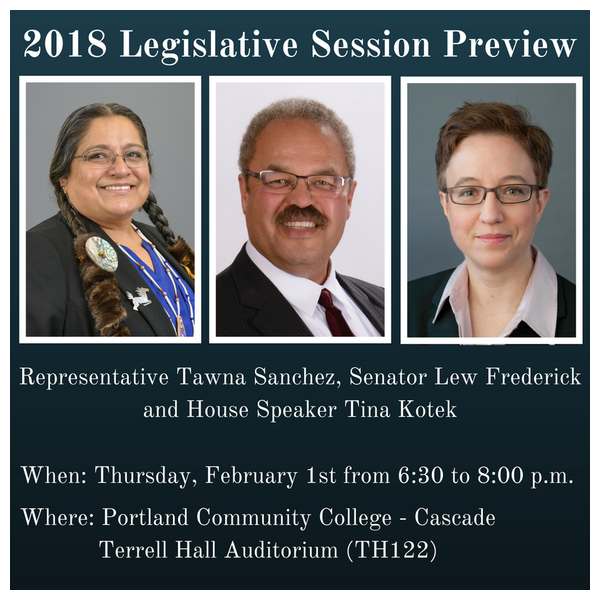 Senator Lew Frederick, Representative Tawna Sanchez, and I will be holding a town hall to preview the 2018 session. We’d like to answer your questions and learn about your priorities. Please join us and share this event with your friends. WHEN: Thursday, February 1, from 6:30 – 8 p.m.
Mark your calendar! I’m looking forward to our conversation.